Monday and Tuesday are my "weekend". I'll try to get all of Act II this week. I may be wrong, but I'm pretty sure in the BTDP novelization it's stated that the dragons the Horde used then were black dragons that Deathwing had "lent" to the horde in order for them to help him carry the black dragon eggs over the portal. Yes - in WoW: BtDP the dragons in Ner'zhul's group were exactly those you describe. But before Deathwing meets with Teron Gorefiend and offers his children, Teron goes to Blackrock Spire to meet with Rend and Maim and convince them to join Ner'zhul--and to lend their dragons. At this time, Rend and Maim's Dragonmaw dragons are still the enslaved red kind, since Day of the Dragon hadn't happened yet according to modern lore. Now of course, in Warcraft II and its expansion, there weren't such things as "black dragons" or "red dragons" yet. Deathwing was called a black dragon, but it was more the way you'd refer to a black labrador or a brunette human--not really a racial distinction. The dragons in Warcraft II were depicted as green, with scales corresponding to the clans they were in. Of course... the fact that the Orc player was red in WCII:ToD and black in WCII:BtDP made it visually easier to believe that the dragons were "red dragons" and "black dragons" respectively. EDIT: Hey, I ordered a replacement copy of WCII: Beyond the Dark Portal from Amazon! By jingo, I'm going to beat that game without cheating. Although the Horde has been driven from the shores of Lordaeron, it has left the townships of Hillsbrad and Southshore in ruins. It is clear that the war will cost the Alliance dearly... Impressed with your victories against the Horde and the destruction of the Zul'dare base, the High Command has decided to dispatch you and your troops to the main battleground. The township of Hillsbrad has been decimated, and throughout the Human kingdoms the rumors of impending doom spread like wildfire. War Chief Doomhammer is pleased with your success and has deemed you worthy of a more difficult task. Welcome to the war, commander. Earlier, I asked you to take a good look at the cover to Warcraft II: Tides of Darkness and immerse yourself in its essence. Not anymore. No more isolated harbor towns and island privateer nests, searching for each other wildly among fog and stormy shores. It's probably still going on, but leave it in your peripheral thoughts for now. Instead, focus back on the Footman armor and the Grunt helmets. Armies marching against each other, forming fronts to flank and advance. Mud, dirt, and mountain. Entrenchments of cannon set in stone, capable of ripping through swarms of overeager warriors who are too impatient to wait for their siege weapons to catch up. For this land is the birthplace of the cannon, and those cannon towers (which we first see in the next mission) assuredly played a role in slowing the tide of the Horde's northward advance. One can imagine the orcs' initial shock at the sheer killing capacity of the cannon, this technological marvel, nothing of which they had seen during their conquest of Azeroth in the last war. In the same way that the Second Sino-Japanese War began two years before Germany invaded Poland and "officially" started World War II, the war in Khaz Modan may have been going on anywhere between a few months to the full six years after Stormwind fell---all before the Alliance was formed and took the lead against the Horde. Though that's not to say there wouldn't have been Human volunteers alongside the Dwarves and Gnomes, perhaps survivors from Azeroth who didn't cross the sea or possibly adventurous Stromgarde or Gilnean mercenaries. We ultimately have no way of knowing. Sadly, the original lore and modern lore both have scant information on the specifics, the battles, and the heroes of this first Khaz Modan invasion. It is the forgotten war between wars. By this time, the Horde has successfully pushed north of the Thandol Valley, the entire continent precariously in their grip. Whereas the coastal Lordaeron campaign was primarily between Azeroth refugees and Blackrock pursuers (with Elven Quel'thalas and Zul'jin's Trolls being dragged in), the war in northern Khaz Modan and what we now call Arathi has a wider spectrum. On the Alliance side, Khaz Modan's Dwarves and Gnomes are joined by reinforcements from Stromgarde, Kul Tiras, Quel'thalas, and now Azeroth. One of the tragedies of gameplay mechanics is that the Ironforge Dwarves are very lightly represented in Warcraft II. The only onscreen unit they claim directly is the Demolition Squad, a kamikaze bomber. Other than that, fans of the Ironforge Dwarves must content themselves with the role they have in Alliance structures such as the Blacksmith and Foundry, and all the units those buildings are necessary for. Plus the aforementioned Cannon Towers and Ballistae, of course. The Horde includes Goblins and Trolls (those native races who, through coincidence or racial undertone, chose to side with the green-skinned invaders) fighting alongside Orcs from, primarily, the Black Tooth Grin Clan. The Black Tooth Grin will dominate Act II in both Alliance and Horde missions, becoming the nemesis to human Stromgarde (the gameplay reason, of course, being that Stromgarde and the Blackrock Clan cannot fight each other in a level, as they are both RED colored). There is also Bleeding Hollow presence in the refineries of Grim Batol, which we covered a little earlier. And in the latter missions here, we will first see Ogres fighting among the Horde ranks. Ogres are not new to Azeroth; one-headed versions of the race had crossed the Dark Portal much like the Orcs, though they somehow had remained an independent fighting force. Perhaps the Horde had brought these ogres over to be allies, but found they couldn't be controlled? Or perhaps a sudden ogre assault on the Portal allowed several of them to pass through, before the orcs regained control of the area again? Whatever the reason, those were not the same as these current two-headed ogres. These new ogres have been recruited by Gul'dan personally; though simple-minded, their loyalty and strength will soon make them the Horde's warhorses and primary rivals to Lordaeron's knights, a replacement for the Horde's wolfriding Raiders (whom Doomhammer had disbanded and filtered into the Grunt ranks, his suspicions goaded by Gul'dan's rumors that they were plotting with the Blackhand brothers to take over the Horde). The Ogres' simple loyalty also allowed them to police the infighting between orcish clans. We don't have much detail on how Gul'dan convinced so many to follow the Horde, but it's not unreasonable to imagine that Cho'gall played a major part in the convincing. Perhaps Gul'dan had hoped these ogres would in turn show more loyalty to him and to Cho'gall, so that he could count on them in overthrowing Doomhammer some day? If so, those dreams would come to be shattered. The Ogres' low intelligence translates to their loyalty being easy to acquire, so that each of the Horde's leaders has his own cadre of Ogre warriors. When the lore tells us that the Ogres reduced infighting between the orcish clans, it is entirely possible that this was similar to the way that nuclear weapons reduced the level of fighting between Cold War superpowers. All sides had access to the devastating new weapon. If you follow either a strict Alliance or strict Horde camaign, then Act II is arguably the most critical phase of the war. The strict Alliance campaign is a surgical strike, a neat path of destruction that ends with the Horde completely withdrawing from Khaz Modan, leaving the orcish forces north of Thandol separated from Azeroth and without their original momentum of conquest. The strict Horde campaign culminates in the fall of Stromgarde itself, the orcs striking down a major enemy kingdom and growing secure at the gates of the final two continents that can resist them. Both sequences start from a single breaking point, the same standoff: Dun Modr and Tol Barad. An argument could be made that the course of the war will be decided in this very next battle. So perhaps it was misleading of me to say the stage of islands and coastal cities was over, because that's where we start now. The Horde has crossed Thandol Valley and stands to expand its conquest to the north and west, but a troublesome human holdout is dragging their heels. Tol Barad is an island citadel defended by a Stromgarde garrison, a garrison that keeps pressure on the Horde by besieging their coastline at Dun Modr. Dun Modr is described as an "ancient Dwarven city", which means either it was a Dwarven city very long ago, or it is a Dwarven city that has existed since very long ago. Now, it houses forces from the Black Tooth Grin Clan---having gained a prominent spot on the Horde's front line, despite their First War fief being so far away in the Black Morass. And do note the maps posted above. The mission maps for the Alliance and Horde version of this level are closer to each other than any other two missions in the game. The Human version begins with a Black Tooth Grin landing party attacking the Tol Barad barracks. The human commander lands with Azeroth soldiers to relieve the Stromgarde defenders, then rallies a sizeable force, and then brings the fight to Dun Modr. In the Horde version of events, an Azeroth army has already fully conquered the Dun Modr area and built a base on its site. The orc commander leads a Black Tooth Grin force to promptly wipe out the Azeroth base, build yet another new site on Dun Modr, and then finish off the Stromgardes at Tol Barad for good. Based on Warcraft II's briefings, it's unknown whether the Alliance and Horde missions were meant to complement each other or to be mutually exclusive. If one combines the two missions into a single battle narrative, the intuitive sequence would be Alliance first and Horde second. Unfortunately, this could raise questions to the canon of an Alliance victory in the Second War, without the path of Dun Modr -> Dun Algaz -> Grim Batol. One way to reconcile an ultimate Alliance victory is to say that the Azeroth force pushed south immediately after taking Dun Modr, and that they were beginning their attack on Dun Algaz even as Black Tooth Grin forces were counterattacking Dun Modr and sacking Tol Barad themselves. Another alternative is to grant the Horde victory in the Act II campaign while having the Alliance win the war regardless---we'll find that this is the interpretation established by lore between 2001 (DotD) and 2007 (WoW:ToD). Last edited by BaronGrackle; 08-20-2013 at 08:22 AM.. In a whole timeline rerospective, given that the Horde kept Grim Batol for some time, I believe the victory in Khaz Modan should indeed be theirs. Alternatively, one may go with the advancing Azeroth option, as you suggested. The Azeroth base at the coast has surprisingly little defenders - they may have moved on a raid down south. I'm not gonna lie, seeing those WCII building sprites literally gives me a partial erection. Haven't we learned that the "orc commander" was actually Varok Saurfang? Baron is currently dissecting the Second War lore from the pure "Warcraft 2" perspective, not the current picture. Look at his original post for details - later chapters would give an overview of the same events from the WC3 and the novel perspective, showing what changes were made as the lore developed from old to new version. What Kir said. And definitely yes... that line from Metzen is what makes Saurfang so awesome to me. Like he took that orc player-character from Warcraft II and said, "This guy's name is Varok Saurfang." I've spoken with Kir before about my headcanon that, in modern lore, Saurfang and Afrasiabi were opposing commanders during the Battle of Tol Barad. EDIT: I have some things to finish in real life that I didn't factor in; I'll try to get another post soon, but I probably won't finish Khaz Modan this week. Last edited by BaronGrackle; 04-23-2013 at 11:56 AM.. Check out this awesome guy. Sorry, that last one's modern. I got distracted for a moment. In the strict Horde storyline, the destruction of Tol Barad has halted any Alliance attempts at a counteroffensive in Khaz Modan. The continent is firmly in the orcs' hands, apart from a bit of hidden resistance--as attested by this mission. And now Cho'gall, chieftain of the Twilight's Hammer Clan, under guard of warrriors from the Black Tooth Grin Clan, is travelling to a base of the Bleeding Hollow Clan, in a force coordinated by a commander from the Blackrock Clan. He is passing through the Badlands (an area near Dun Algaz, which is today the Wetlands), to inspect Grim Batol--the Horde's industrial center of oil refineries. With the death of Blackhand, Orgrim was quick to seize control over the Blackrock clan - the most powerful Orcish force on Azeroth. While others still vie for supremacy over the rest of the scattered Orc clans, Gul'dan, the infamous Warlock and chieftain of the Stormreaver Clan, is rumored to be amassing a great navy to find the legendary Tomb of Sargeras for himself. Rend and Maim, the barbarous sons of Blackhand, also have secured a strong following amongst the Orcs, and hope to wrest ultimate control of the Horde away from the treacherous Doomhammer. Although other factions grow stronger within the chaotic Horde, it seems certain that all of the clans will follow Doomhammer's plans to hunt down and destroy the renegade Humans of Azeroth wherever they choose to run. The Horde is cooperating under Doomhammer, toward the common goal of conquering the world of Azeroth. But under the surface, we see the three major subgroups: Doomhammer loyalists (Blackrock and Bleeding Hollow), Gul'dan loyalists (Stormreaver and Twilight's Hammer), and Blackhand loyalists (Black Tooth Grin and Dragonmaw). All three of them have representation in this mission. Now, let's talk about our man Cho'gall. There are a few unique units in Warcraft and Warcraft II, but Cho'gall is so far the closest we have to a "hero" unit. At this point in the Horde campaign, he is not only the first ogre-mage we've seen but the first OGRE--thus even with close to standard ogre stats, he's your toughest guy in this mission. But he also has full access to every ogre-mage spell; this gives him a very "leaderlike" feel as he sets up Rune traps, Bloodlusts key soldiers, and/or scouts the map with his Eye of Kilrogg. Eye of Kilrogg. Named for Kilrogg Deadeye of the Bleeding Hollow, whose clan had been at odds with the Twilight's Hammer at least from the time of the failed assault on Stormwind Keep that started the First War. Have you ever stopped to wonder at the fact that this spell, which we first see exhibited by Cho'gall personally, is named for a leader that he had a personal rivalry against? I'd like to see the story of how this warlock spell got named. A serious version would be warlocks who hold Kilrogg in great respect, to the frustration of Cho'gall. A less serious version would be a bet that the two chieftains made in a tavern one night, a bet that Cho'gall lost. But I'm getting distracted again. Anyway, it's interesting to see Cho'gall in his own element here. What I mean is, so often we think of him as the lapdog of Gul'dan, or later as puppet of the Old Gods. But this instance, this journey to inspect Grim Batol for the good of the Horde's war effort, this is the same Cho'gall who co-led that assault on Stormwind Keep during the First War. This is Cho'gall the chieftain of the Twilight's Hammer, a prestigious orc clan, he himself not an orc (and that's another story I'd like to see played out someday). It's a pretty big deal; how many non-humans do you see leading a human nation? He and Mogor in Beyond the Dark Portal seem to have been the only ones influential enough to break the racial barrier of orc-human leadership in the Warcraft II nations and clans. This is the Cho'gall whom the manual describes as one of the "most respected leaders within the Horde". Not one of the most respected leaders in Gul'dan's clique. One of the most respected leaders in the Horde. Regardless, we see that the continent of Khaz Modan is not so firmly in the Horde's grasp, as a band of Stromgarde soldiers have set an ambush for the chieftain. One might imagine these warriors were from an expeditionary force cut off as the Horde pushed northward to priority targets, or perhaps they snuck through enemy lines from the north or via ship from the west. We also see elves and gnomes here, but gameplay practicalities mean the dwarves are absent on screen... though again, they could very easily be the crewmembers of the ballistae. As Cho'gall and his Black Tooth Grin protectors force a path through the Badlands, we see their destination in Grim Batol has the color of Bleeding Hollow green. Usually I don't attribute much to the "rescue passive" groups (as they don't even show up on the victory screen), but this matches other in-game depictions of Bleeding Hollow commanding the Grim Batol refining operations. With that whole relationship with Dragonmaw-at-Grim-Batol vs. Bleeding-Hollow-at-Grim-Batol, perhaps the manual writers were meant to have placed the Bleeding Hollow at Grim Batol. Or, perhaps the level designers were meant to have put the oil refinery levels at Ironforge. But if we take what we have at face value, then there are two separate operations going on at Grim Batol--the oil refineries, and the dragon roosts. Like Zuljin or Uther, you can actually kill Cho'gall after crossing the Circle of Power and still win the mission. He'll come back in the later level anyway. He's "just too tough" to let something like death keep him down. Well. I think it's time to separate the Horde and Alliance campaign maps. Keep in mind that the orc and human missions aren't necessarily exclusive at this point, that it is possible for some of them to co-exist... but the overall feel of the mission briefings has drifted far enough apart that I feel separate war maps are appropriate. What is this? An actual base-building LAND battle?!! No navy required?!!! The Human Act II campaign is a linear 1, 2, 3. Dun Modr, Dun Algaz, Grim Batol. Dun Algaz is a transition level, a bridge, so it's only appropriate that it focuses on what is arguably the most famous bridge in Warcraft: Thandol. And the three land bridges of the Thandol Valley are a perfect testing ground for the new land powerhouses: knights and ogres. The Kingdom of Azeroth had knights who shaped the course of the First War, armed with flails (described as "maces" in the manual). In terms of lore, they turned the tide at the first attack on Stormwind Keep, indicating that the mounted iron soldiers could overpower the orcs' more lightly-armored wolfriding Raiders. Those knights still died, of course. The knights of continental Lordaeron prefer to wield warhammers, we find. And, considering the knights of Azeroth are said to have been killed in the First War, it's possible that the "blue" knights in our gameplay are not Azeroth survivors but are in fact volunteer soldiers from Lordaeron, in the same way that Elven Archers are soldiers from Quel'thalas and Flying Machines are from the Gnomes, etc. It's just a theory of mine; no hard evidence--especially since everyone in this war seems to be wearing Lordaeron's stylized "L" to symbolize the Alliance of Lordaeron. The map for this mission depicts the world map more visibly than perhaps any other--representing, of course, the three crossings at Thandol Valley (named only once in the game, during this mission briefing). In modern lore that will come later, Thandol is a constructed "span". In the demo lore that came before, Thandol was a solid icebridge that was only present during winter. For the lore of this moment, however, Thandol is a muddy set of isthmuses. Which means it can't be destroyed to block an advance, like a man-made (or dwarf-made) bridge. And it won't melt away in warmer months. It is an ever-present, critical bottleneck between the two halves of the known world. And once the mission ends, Alliance forces have entered Khaz Modan and overpowered Dun Algaz, placing themselves in position to strike against their primary target. Last edited by BaronGrackle; 08-20-2013 at 07:23 AM..
Great thread A bit bittersweet considering what has happened since then, but at least this'll give the newer kiddos an idea of how awesome the setting used to be. My blood cries out for the vengeance of my people's blood, which can only be repaid with at least twice as much blood! Or maybe three times as much blood! Like if you went to hell, and it was full of blood, and that blood was on fire, and it was raining blood, then maybe that would be enough blood! Eh� but probably not. In the RTS game Command and Conquer: Red Alert, an alternative version of World War II has the Soviet Union rolling west against the Allied powers of Britain, France, and Germany. In that game's Soviet campaign, one level in the middle sticks out as a key moment in the narrative: the fall of Berlin. Cutscenes show Soviet soldiers parading through the conquered capital as Joseph Stalin watches on a television, gleefully laughing with his mistress. Sure, the Soviets have a long way to go until victory. Britain and France are still relatively untouched, the surviving Germans are going to keep up what fight they can, plus there's the potential for U.S. entry. So much more to conquer, yet so much conquest that has already been achieved. See, when a defender wins a campaign, there is generally a turning point; there is a moment when your ragtag alliance stops defending and begins to counterattack, and it's easy for that moment to feel incredibly satisfying. You don't have this moment in an invader's campaign--the invader's campaign begins with an offensive and just keeps going until the end. Instead of turning points, you will see milestones. And, naturally, a most satisfying milestone is taking the second or third strongest nation in the enemy's alliance, and smashing its capital city like a clay pot. You don't get too many examples of this from actual history, at least I don't think so. It's a rough fight for invaders taking down alliances of nation-states--Napoleon could take out Austria or Spain, Imperial Germany could knock down Russia, the Nazis could conquer France, but they all suffered later turning points against them. You could look to Alexander the Great in Persia or Genghis Khan in China, but that's more like taking down your strongest adversary before a smoother progression, plus it's without being opposed to a modern-style alliance system. Well, Stromgarde. Glancing at the map, it's a natural progression from Dun Modr. No doubt Thoras Trollbane saw this battle coming, and has probably fortified his defenses to prepare for a land assault from the south or east. Too bad the attack will come from the coast. Oh snap! For some reason, Stromgarde soldiers and ships have captured a few orcish transports and are standing guard over them, perhaps waiting for orders from their superiors as to how to proceed. The Black Tooth Grin suddenly appear in force, overwhelming the small guard as Troll Destroyers sink their elven counterparts, then deposit sailors unto the Transports and set them underway. The group sails to a lightly-defended island and tears down its garrison, then builds up for a quick assault on Stromgarde Keep--an action which, I wildly speculate, would have completely surprised the capital's defenders as they had pointed their defenses toward a presumed land assault. We can credit this as an example of orcish military ingenuity, either from the player commander or the Blackhand brothers. And of course, this is the first level that the orc commander can train ogres. So there's a good chance that ogres destroyed Stromgarde Keep here. Even though this battle involves a major capital, you'll notice Stromgarde Keep takes its name literally. It has only a Keep, not a Castle. This was in most likelihood a mere gameplay mechanic, since it comes in an early level. Maybe. But, on the other hand, I prefer to think it's a reflection of Stromgarde's . . . "spartan" demeanor. It adds character, especially when we look back from the modern era and know that this kingdom descended from Strom. This is Old Rome, still holding firm to her military heritage, ignoring the fact that her breakaway daughter kingdoms are far more affluent than she. But what is wealth? This is a war! And no one in the Alliance can deny the service that Stromgarde has performed in the continental vanguard. . . .at least, not during the Second War. Of course, considering Stromgarde's minuscule presence in WCII:BtDP and Warcraft III, and its eventual offscreen destruction, it may as well have been. That would have certainly gone a long way to explaining the apparent weakness faced by the kingdom in modern times. Plus, considering all those examples of Napoleonic and German invaders taking down a few enemy nations before the turning point, it may have been appropriate material for a war worth taking seriously. Skipping ahead again... even with this specific event being noncanon, one might wonder how similar it is to what would actually happen after the Third War, off-screen, in Stromgarde's kingdom. We know Thoras Trollbane would be assassinated, but we also know his son Galen was alive, so the instability can only go so far. How did that translate to an ogre band claiming the city? Well, what if a clever ogre leader (a veteran of the Second War, let's say) came up with the idea of seizing transports from the south and surprising the capital from the sea? Since we know so little about the real-lore destruction of Stromgarde, it's a sound possibility. It's also easy to visualize. Between Hillsbrad, Southshore, Tol Barad, Stromgarde, and the upcoming battles on Darrowmere and Tyr's Bay, the Horde forged a path of victory through sea dominance and relentless amphibious assaults--flourishing their Viking motifs brilliantly. Here we see the aftermath from such a sea battle, with ship wreckage and human bodies sinking to the depths. One is intercepted by the cutscene's featured figure: a Giant Turtle. The manual gives credit to the Stormreaver Clan for this military advance (note: not Gul'dan personally), stating the sea turtles are tamed by "potent spells of control" and piloted by daring goblins in watertight canopies. If the Old Horde's Giant Turtles do still exist in modern lore, my headcanon is that they were domesticated by a joint effort from Goblin warlocks and shaman loyal to the Stormreavers, and that these Goblin magic-users could form a connection to their seamounts akin to that of dwarven gryphon riders. Of course, there's no direct evidence for any of that. This cutscene is actually premature; you won't be able to build Sea Turtle units until Act IV. It's most likely just a disconnect between storyline and gameplay. If we elevate that disconnect into lore, though, it means someone in the Horde is using the Turtles before the player commander has access to them. Prime candidates are the Blackrock squadrons still harassing Lordaeron's shoreline, or (more likely) the Stormreaver fleet. The latter would ostensibly be keeping the Kul Tiras navy occupied while covertly maintaining an underwater search for the Tomb of Sargeras. Yes. That would make the most sense. And it emboldens me enough to fabricate a couple of battles in the Southern Great Sea, as the Stormreaver fleet searches for the Tomb in Kul Tiras's backyard. On 1 August 1943, Allied bombers rained destruction on nine oil refineries based around Ploiești, Romania. It had little impact on Axis oil output, but it did cause some really impressive explosions. On 10 September 1812, the Battle of Lake Erie (called the Battle of Put-in-Bay in my classrooms) established U.S. naval dominance over Erie for the duration of North America's War of 1812. Before the battle, the U.S. had rushed through the construction of six new warships on the lake, gaining a numerical advantage over the British. On Day 39 Month 3 of 4 ABY, the Rebel Alliance destroyed an Imperial shield generator on the Forest Moon of Endor, which enabled the destruction of the Second Death Star during the simultaneous space battle. One critical and iconic moment of the Battle of Endor was when Rebel leader Chewbacca commandeered an Imperial AT-ST, turning the walker's firepower against other AT-STs and ultimately enabling a ruse to capture the shield generator base itself. If these battles made sweet love to each other, their unclean progeny would be the first Battle of Grim Batol. Even if we don't know why oil was important during the Second War, we do know that it was somehow very important. And, if Blackrock Spire and Lordaeron City were our factions' political capitals, all evidence suggests that Grim Batol and Stratholme were their industrial capitals. This mission takes place in two distinct phases. The first phase is a non-construction section; the Alliance starting forces march south to defeat a light Black Tooth Grin garrison. It is here that, in a stroke of luck, they are able to commandeer three unmanned catapults. Boarding transports, our light strikeforce takes a quick trip east and finds the main Black Tooth Grin base, whose Cannon Towers would've made short work of the tiny Alliance squad if not for their pilfered catapults. As a side note, remember that these Nation of Azeroth soldiers were using catapults similar to these during the First War. For all we know, maybe some of the traditional heads are more comfortable working these ol' reliables, instead of the newfangled giant crossbows. After eliminating the Black Tooth Grin and seizing their gold mine, the second phase begins: Building a battleship fleet in the adjoining lake and bombarding five Bleeding Hollow refineries to the ground. And truly, it is a naval one-sided beatdown. Extremely satisfying. The mission begins with the aura of a commando raid, and it ends with the Azeroth boys seizing full naval control of Grim Batol's unnamed lake (which modern lore tells us is Loch Modan), with an overwhelming fleet that they built from scratch, probably in a matter of days. Just... reflect on the prodigal output--this was potentially a fully-upgraded squadron of Battleships thrown together just for this lake, just for this battle. That means this strikeforce came prepared not only with pitcrew-speed shipbuilders, but also with a pack of skilled sailors just waiting to take control of ships as they came off the line, deep within Horde territory. And none of these battleships will be leaving the Loch; there aren't connecting rivers, and the humans probably wouldn't have the time or skill to portage the hulking warships all the way to the Great Sea. After the battle, they'd pretty much be as stationary as aquatic cannon towers. The Alliance mission doesn't even raze Grim Batol completely; it just trashes the Bleeding Hollow's refineries. But that's all it takes. Lothar predicted this pinpoint strike would serve as a kick to the Horde's gut, that it would drive them to abandon the continent entirely. And he was right, which we discover in the next Mission and Act. With their oil patches burning, a sudden Alliance fleet materializing on the continent's central lake, and constant pressure from Dwarven/Gnomish/Stromgarde resistance, the orcs cut their losses in Khaz Modan and pull out of the region. I suppose the situation could be comparable to taking every oil source in the Middle East and destroying it--one imagines the area would lose significance in the eyes of the world powers. An epilogue to Grim Batol. Fans of Warcraft III may recognize this scene from that game's end credits. Only without Archimonde directing it. Earlier, did I use the words "disconnect between storyline and gameplay"? Well, here we are again. "Hey, catapults can't attack air units!" But still, we could believe it. Seeing that zeppelin fly so low, aware that a catapult fired in a rising arc, it made sense on screen. And the fact that this random, clean-shaven footman could just ambush a grunt, fire his catapult, and have it hit a mobile flying target--the scene just feels so impromptu, so serendipitous, much like the Grim Batol mission itself. The incident is likewise seemingly insignificant in the grand scale: one grunt, one catapult, one zeppelin. What's the value? And likewise, a mere five oil refineries belonging to a single base (okay, five does sound like a lot)... and yet, their destruction leads to one of the most dramatic territorial changes in the entire war. Can you just imagine the Alliance propaganda after this event? That swashbuckling footman probably won himself a King Llane's Medal or something. And the triumphant player commander's career would only soar higher. At first, nothing had seemed able to stop these grotesque invaders, but gradually what had looked to be a horrible slaughter had turned instead into an agonizing stalemate. Battles had been won by attrition. But that had finally changed. The Alliance had at last managed to push back the Horde, eventually routing them entirely. By my reckoning, Grim Batol was the prime event that changed the wars from a "horrible slaughter" into an "agonizing stalemate". It was the first turning point. The next act will have us campaigning during that stalemate. And that will end with the fall of Alterac, when the Alliance begins to "push back the Horde". The second turning point. For both the Horde and Alliance campaigns, this is the central moment of the war. Act III will begin the second half. Last edited by BaronGrackle; 08-20-2013 at 08:23 AM.. I've been considering. It may be better for me to just skim the events of Warcraft II: Beyond the Dark Portal without going into as much detail on each mission, and focus instead on just the Second War proper (up until the Dark Portal's first destruction). And only AFTER examining the lore development of that war, maybe then going back into details for the Invasion of Draenor. Last edited by BaronGrackle; 04-29-2013 at 10:38 AM.. I believe you'd like it. Maiev's and Rexxar's campaigns are mostly adventures with many glimpses into lore, Arthas's is a BTDP-style quest rush, but Kael and Sylvanas operate within larger military campaigns, with set goals and missions related to a specific war. You like that "capital T" after the apostrophe? Well forget about it. We're not going to spell it that way again until Of Blood and Honor. 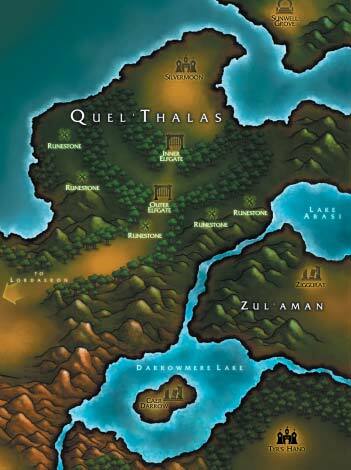 Quel'thalas is frequently cited in the games and manuals as the home of the Elves. Unlike the Khaz Modan campaign, we see a considerable amount of the war in this region. Yet also unlike Khaz Modan, this subcontinent and its boundaries are extremely vauge. The same applies to the Elven kingdom itself. The only location verified to be Elven is "Silvermoon", an enigmatic capital (?) that never appears in maps or missions. The main map itself cuts off at the northeast corner with our continent incomplete, indicating a strong probability that Silvermoon and more Elven territory indeed lay in that direction (as later lore indeed confirmed). Regardless, one can still wonder how many of the listed cities fall under the purview of that continent or kingdom. 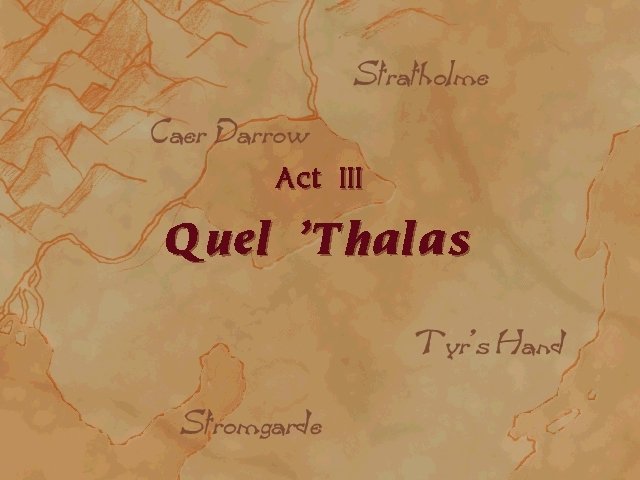 Stratholme is right by the region's title on the map--is it part of continental Quel'thalas? Is it part of the Elven kingdom? Is Caer Darrow? Is Tyr's Hand? If they were, there would be no way for the game to depict it, as there are only player colors for the human kingdoms--none for "Nation of Quelthalas", just as there is none for "Nation of Ironforge", etc. As it is, these three towns (Caer Darrow, Tyr's Hand, Stratholme) will be represented differently depending on your campaign. The Horde player will find Tyr's Bay as Stromgarde with Caer Darrow and Stratholme as Azeroth (the attack on "Quel'thalas" is also represented by Azeroth blue). The Alliance player will find Tyr's Hand as Kul Tiras with Caer Darrow and Stratholme as Lordaeron. Perhaps related, the Horde campaign has the Blackrock Clan as the strongest orcish force in the area, while the Alliance campaign places the Stormreavers in this role. When comparing the differences, we have to confront one more reality of Blizzard's gameplay choices: the colors of enemy forces are more reliable in depiction than the colors of the player's forces. What I mean to say is... the orc player will be Blackrock red (or Shadowmoon black, in BtDP) and the human player will be Azeroth blue every time, except when that color slot is taken by the enemy. This is why the Orc Player is Black Tooth Grin in every level against Stromgarde, and the Human Player will be Lordaeron in every level with the Stromreavers. This places a strong argument in favor of the player's forces actually being a "unified Alliance" or "unified Horde" army--especially apparent in the BtDP missions (which has EVERY level as Azeroth blue or Shadowmoon black, since you never see orcish Flowerpickers or human Gilneas), where a pure interpretation would mean the Nation of Azeroth invaded Draenor alone, or that the Shadowmoon Clan invaded Azeroth's world alone, despite briefings and hero nationalities indicating otherwise. But even with this in mind, it can still be valuable to extend such gameplay decisions into lore when plausible. That's what can give us the imagery of a Strongarde-Black Tooth Grin bitter rivalry, or of Lordaeron's home forces unilaterally marching on Alterac, or of a tough-as-nails brigade of Azeroth survivors becoming famous for their wartime feats. With all these factors in mind, would you like my retro-headcanon interpretation of the different forces? In my mind... a Black Tooth Grin victory over Stromgarde keeps the Horde in an ideal position for conquest. Doomhammer orders the Black Tooth Grin to secure the continent's east coast, while his own Blackrock fleet resumes what it had started in Act I, sailing up a major river to Darrowmere Lake. Bloody, bloody Darrowmere. With the Black Tooth Grin pressing to the east and the Blackrocks pressing to the west, Doomhammer will eventually spring his primary land force through the center--shattering the Alliance's industrial center before knocking Quel'thalas out of the war. The Stormreavers are ordered to pick up the pace in the South Seas, perhaps by either finishing Kul Tiras or moving against Gilneas. However, Gul'dan himself is with Doomhammer as magical adviser to the main campaign, primed to complete his two new weapons for the Horde. The Alliance prepares for inevitable invasion as best it can... the Azeroth refugees took a bloody nose at Dun Modr, but their brigades still have enough strength to fall back and command defense in the Northlands, hoping to hold the Horde off while Terenas and Lordaeron prepare a second-line defense, with the option of counterattacking if the Azeroth defenders hold. Stromgarde's survivors and the tiny Kul Tiras expedition, beaten and broken, are pushed to Tyr's Hand where they fortify themselves. A successful Alliance destruction of the Grim Batol refineries shows a slightly different war, but with important parallels. The Azeroth boys have secured a continent and are now probably cleaning up alongside local freedom fighters and, most likely, building up their Great Seas fleet for the final campaign. Kul Tiras and perhaps Stromgarde takes the same position on the east coast, not wanting Horde forces to catch them off-guard. And, as Azeroth is occupied to the south and at the sea, it is Lordaeron who fills the void of defending the Northlands. And it is Lordaeron who will be caught up in the intrigue of Human Act III. Yet the Horde, in abandoning Khaz Modan, has not simply pulled south in retreat. Multiple divisions would have fled north or east to regroup with forces already in that area. Doomhammer, his own Blackrock fleet reduced and considerable supplies lost from Grim Batol, orders Gul'dan's still-vibrant navy to sail north and establish a presence on Darrowmere. Of course, Gul'dan will make the same unit discoveries as in the Horde campaign... though I'd wager it's his Stormreavers who seize the Runestone from Lordaeron defenders, in this reality. And it will be his Stormreavers who find themselves present in every level, doing their utmost to keep the Horde's special mole in place. Last edited by BaronGrackle; 08-20-2013 at 08:24 AM..
See, I think we can blame WoW for screwing up the geography so bad that Darrowmere somehow ended right in the centre of Lordaeron, instead of its northeast part (although WC3 moved Stratholme from Darrowmere to the sea). In fact, the lake is very much NOT in Lordaeron on this map. Tyr's Hand's status is trickier - we can see it on the QT map, but it's also greatly divided from the rest of the continent with mountains. In fact, looking at this map, it's quite possible that it was indeed a part of Stromgarde in this era. My personal headcanon was that Stratholme, Tyr's Hand and the whole region east of the Darrowmere Lake was a historic part of the ancient Quel'Thelas around the Troll Wars. The trolls managed to reconquer this land (except for Caer Darrow), then the humans came to help the elves and managed to defeat the trolls, but decided to keep the lands for themselves, constructing their own cities (with distinctly human names). Of course, Kir, my favorite part of that Warcraft III map is that it confirmed the Runestone of Caer Darrow was seized quite violently. The Stromgarde-Kul Tiras vanguard has retreated northeast, to Tyr's Bay and Tyr's Hand respectively. Lothar's army has fallen back north, assuming tactical command over the defenders at Caer Darrow and the Quel'thalas border. I hate to use the Fortress icon on anything other than Blackrock Spire, but the Horde has built up its defenses at Crestfall and the Dark Portal, so that has to be represented sometime. The Alliance knows that an attack on Quel'thalas is the next logical step in the Horde's path of conquest. But the question of the hour is: Where will this attack come? Which section requires the most attention and reinforcement? We imagine that a similar question could be brewing in the minds of Horde chieftains. While the Blackrock main forces did ravage Lordaeron's coast, it was the Black Tooth Grin who won the war for Khaz Modan and took down Stromgarde. They have already fortified their capital in the Black Morass, erecting a fortress whose magnitude rivals even that of Blackrock Spire. Will the sons of Blackhand also win the glory and prestige of rampaging north through the Elven homeland? Doomhammer cannot allow that. It must be his Blackrock who triumph during the next campaign. It must be his Blackrock who win the war, thus solidifying his position as warchief for the quickly-approaching days when the Horde clans no longer have a common enemy. Fortunately, the Stormreaver Chieftain Gul'dan is all too eager to give ideas on where the Blackrock should strike next, to affirm their dominance. Hey, wait a second. What's that Great Hall doing to the west of Darrowmere Lake? Do you see the narrow passage of water, flowing offscreen to the west of the Horde base? Yeah, that's a river. Check the regional map again, or the world map even. The Blackrock fleet sailed upstream from the Great Sea, along the major river that modern lore may or may not call the Thondoril River, and they set up camp at the entrance to Darrowmere. Knock knock. That's awesome. Say, I wonder why Alterac couldn't stop them from passing through the river . . . If we were 100% sure the Fall of Stromgarde never happened in the canon campaign, then we were 100% sure that the attack on Caer Darrow did. The Warcraft II manual has a section labeled "Places of Mystery", and in it are three sites: the Portal, the Tomb of Sargeras, and the Runestone at Caer Darrow. The Runestone was an ancient monolith erected by the Elven Druids and inscribed with powerful runes of protection and warding. The Runestone, seized by Gul'dan and his Ogres, was eventually hewn into slates that were then used to construct the Altar of Storms. The elves, knowing that their sacred artifact had been defiled to created the Ogre-Magi, have sworn to destroy all of the unholy Altars across the kingdom. Their magiks, so closely tied to the forces of the earth, had shown evidence that the Orcs had been defiling the very lands of Lordaeron as part of their sinister plans. At this point in lore, the Elves are much more aligned with the forests, nature, and skilled archery--with any references to magic being in hidden sections of the manual, again in relation to the forests and nature. These Elven "druids" are probably more similar to the modern understanding of shaman than to the animal-morphing druid class we know today. Caer Darrow's current population is something of a mystery. First of all, consider that the Runestone is not technically on the island of Caer Darrow; it's on a tiny nearby islet in Darrowmere Lake. That tiny islet contains a Human Castle (specifically human, according to the mission briefing). For all we know, this Castle could have been guarding the Runestone for generations, or for mere days. Who lives at Caer Darrow and the nearby citadel? Is it a Human-Elven mixed settlement? Or did the Elves leave this place centuries ago, after which Humans inherited the land? It's impossible to say, save that the Castle itself is a symbol of political unity between Humans and Elves--the Humans bearing the responsibility for guarding this historic Elven site, either by official obligation or through uncodified tradition. Perhaps Caer Darrow has become a microcosm of the Alliance crucible, a melting pot for which it is impossible to determine where the border is between Human and Elven culture. In fact, the secondary reason Gul'dan orders this attack is to create bad blood between the Humans and Elves. It's curious to note that, at this point in lore, this attempt at fracturing the Alliance produces no in-game results, neither in the remaining Tides of Darkness missions nor in the lore of Beyond the Dark Portal. However, we'll see growth there later. But anyway... we talked about the secondary reason Gul'dan ordered this attack. Let's talk about the primary one. The reason we knew this mission happened, that it was not a variable but a fixed point in time, is because of it being a prerequisite for the MOST IMPORTANT UNIT in Warcraft II: the Ogre-Mage. The primary reason Gul'dan wants this attack is because he sees this potential within the Runestone's power. Remember that other than Gul'dan and Cho'gall, there are no other warlocks in the Horde. None. And before 'Danny starts experimenting, the only verified magic users in the Horde are those two along with Zuluhed the Whacked. The capture of the Runestone will change this, as Gul'dan--perhaps inspired by Cho'gall's natural affinity--perverts the stone's energy into these ogres. This happens when the Runestone is carved into a set of unholy temples: the Altars of Storms. In real life, certain Christian groups have venerated pieces of the "true cross" as relics. If we start to look at pieces of the Runestone of Caer Darrow as composing all of these Altars of Storms, we find a conundrum similar to that asserted by John Calvin. In brief, if all the pieces that could be found were collected together, they would make a big ship-load. Yet the Gospel testifies that a single man was able to carry it. Now interestingly, studies of the True Cross pieces have shown that if all were factored in, it still leaves a fair amount of the Cross unaccounted for. I like to think that such would be similar in the Warcraft universe with the Runestone... my retro-headcanon would say that a similar saying existed in the Warcraft universe for these sections of the Runestone, but these sayings were inaccurate due to some magical properties that would allow the stone's resources to be stretched to several altars. An important note about the ogre-mage: he is NOT a mage; he is a warlock. Granted, the spells of the ogre-mage were original - none resembled those of the Warcraft: Orcs & Humans Warlocks, despite lore telling us their magic comes from the warlock class. Gameplay is as gameplay does, but could it be possible that warlockery manifests differently in Ogres than it does in Orcs? Perhaps. Though the proviso to this is that the lore gave the ogre-magi more ranged-zappy powers than was indicated in-game. Once hulking simpletons, the transformed Ogre-Magi can direct their death magiks as easily as their lesser cousins would deliver a crushing blow to any foolish enough to stand in their path. Not exactly what we see in-game. The game has ogre-magi very often delivering physical crushing blows, only with a handy Bloodlust blessing. Apart from birthing the most notorious unit in Warcraft II's metagame, this mission also distinguishes itself with limited objectives. The orcish commander is only required to capture the Runestone and destroy the Castle guarding it. Combined with the later Alliance mission in this area, we can follow the implication that Caer Darrow itself survived, at least partially. But with all the hubbub on this Runestone and the upcoming ogre-magi, it's easy to forget about the unit that is being introduced right here right now. The answer to the Battleship: the Ogre Juggernaut. Guns, all guns. The design almost looks like an ironclad, which would imply that (lorewise, not in gameplay) it could possibly take more damage than the Alliance's Battleship. With this ship's name, we have an intriguing lore mystery: Why is this ship called an ogre juggernaught? The manual, so descriptive on the crews of Troll and Elven Destroyers, so explanatory on the naming of the Eye of Kilrogg, is silent here. Is the ship called "ogre" as a metaphor, for its sheer size and power? Or, did this behemoth require the strength of ogre builders to construct? Are ogres involved as crewmembers, in some capacity or completely? It's just one of those mysteries that will die in later lore, as the term and then the unit are abandoned. But in the meantime, the Horde has its shiny new Runestone. Now we leave the lakes and pan right, to the only known battle to take place east of the continent in what modern lore has named the Forbidding Sea. We're back to Black Tooth Grin forces under player command, as the enemy is their clan's archnemesis: the bitter survivors from Stromgarde. Of course, I SAY it's the only known battle in the Forbidding Sea, but that doesn't include the demo mission at Thandol. Though probably noncanon, this mission indicates the Horde first had a stronger naval presence in the Forbidding Sea before developing its navy in the Great Sea. This makes all too much sense when we consider the location of the Dark Portal--the orcs would've gained access to Azeroth's eastern coast before its western. Still, the strategic/economic importance of the Great Sea makes it natural that the latter would grow to be more hotly contested through the course of this war, thus leading to the Horde sharing the Alliance's emphasis on the Great Sea theatre and neglecting the less critical Forbidding Sea. This mission is actually a misnomer--the Horde's objectives aren't to raze Tyr's Hand to the ground, but to blockade the bay. the creation and defense of a Fortress at the mouth of Tyr's Bay, cutting off the Human supply lines into Quel'thalas. I just quoted the only part of the mission briefing that isn't talking about your new Ogre-Magi. But we already harped on them a moment ago; they're actually not very critical to this naval-heavy battle. The Horde juggernaughts will again be the movers and shakers of the mission. And that isn't surprising, since this level and the previous one are extremely similar in practice. Just like the last mission, the player must capture a tiny, fortified island that is supported by a larger but less advanced town (Town Hall on the mainland; Castle or Keep on the tiny island). In this variant, the Horde Eastern Fleet secures the nearby island and garrisons it with a Fortress and a Shipyard (the isle has a Circle of Power, to mark it for the victory condition). According to the briefing, this new base will cut off Human supplies from being shipped to Quel'thalas, softening the Elves for the Horde's imminent invasion. This mission combines thematically with the previous mission in isolating the Elven Kingdom from its Human allies--the previous level seeded political isolation; the current one sows economic and military isolation. But there's also another element in play here. Both Caer Darrow and Tyr's Hand survive these two battles, with civilian casualties quite possibly at their lowest after a fight against the Horde. But the two incidents demonstrate a significant point, one that's easy to overlook in our current understanding of the Old Horde's level of sophistication, especially looking at its visually crude, ugly buildings and ships. The point is that, in these two battles, at this point in the war, the Horde navy is superior to its Alliance counterpart. Either through technology or tactics, the Horde fleets seize naval superiority in both Darrowmere Lake and the future-named Forbidding Sea. Most importantly: this happens in the Human campaign as well. Well, Caer Darrow certainly does. But this mission at Tyr's Bay is also a strong candidate because... well, it's a cheap victory. The Horde simply fortifies an island and blockades a town. Tyr's Bay remains intact. The inland section of Tyr's Hand isn't even touched. It's a Horde victory that would cost the Alliance story nothing except a little pride. The Alliance nations would learn that, if they want any hope of defeating the orcs at sea, they must up their game in shipbuilding and strategy. For that reason alone, treating these battles as part of the canon lore does nothing but expand the scope of the narrative. Last edited by BaronGrackle; 08-20-2013 at 08:25 AM.. I've been following this thread with great interest, to the point that I've actually registered just to share my views on the matter! I especially like your maps BaronGrackle... But I was wondering - currently you are going for a strict Horde/strict Alliance approach. Aren't you going to try and merge both versions? Which to say - in this combined version, even thought Stromgarde has been raided, the Blacktooth grin clan has been weaken and the land path is not secured. 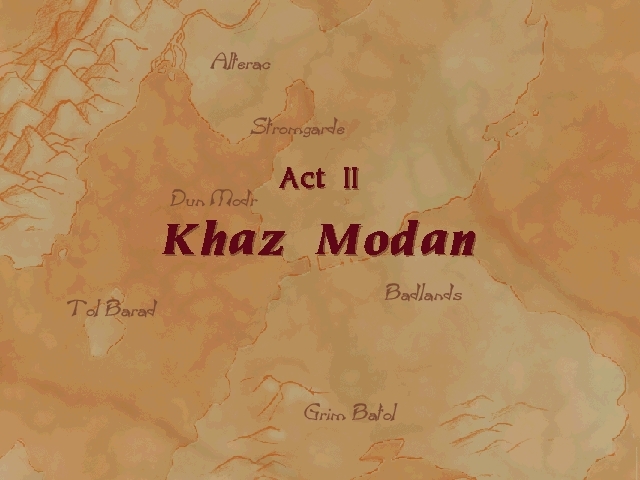 That is in favor of the Horde using naval superiority in the beginning of Act III, instead of going through Khaz-Modan. However, the Orc campaign stated that for the upcoming Act III, Grim Batol oil was an absolute necessity. Thus, the Alliance may have over-exaggerated the impact of their raid, Grim Batol could have recover very fast from it - this again is in favor of the orc naval approach at the beginning of Act III. In this version, the very reason for Cho'gall to travel to Grim Batol and check if everything is alright is the Alliance raid. An interesting point about Cho'gall is that the map places the 'badlands' north of Grim Batol. Meaning Cho'Gall isn't coming from Azeroth. I personally imagine that both his clan and the Stormreavers are already ahead the front lines, hidden from the Alliance, in the Alterac plains/mountains. Gul'dan would be in charge of collecting intelligence from the humans, much like the Shadow Council was doing in Warcraft : Orcs and Humans, and Alterac would be of great help for that. The impact of the Grim Batol raid was probably huge for the Alliance moral, to the point of worrying Gul'Dan and Cho'Gall and requiring this inspection. I'd like to add that in effect at the end of Warcraft II, after the fall of Blackrock spire and the destruction of the Dark Portal, there is still an orc presence in Khaz Modan : the Bleeding Hollow clan is still there, and according to later lore the DragonMaw clan was as well, despite their participation in the last battle : they probably hadn't brought Alexstraza herself. Which mean in all cases, Lothar was wrong in assuming the Horde would gently leave Khaz-Modan by themselves, following the raid on Grim Batol. That's part of the reason which makes me doubt that this part ever happen, even in a strict-Alliance scenario. It was just an assumption made by Lothar, and later proven wrong. So, a map of the situation at the end of Act III would be a replica of the what it was at the beginning of the Act, but with both Stromgarde and the Blacktooth grin clan weaken and their bases having suffered lots of destruction. You could add a medium fire on the refineries of Grim Batol, and peons repairing it.. I mostly agree with the way you reconstruct Act I. The only difference in my mind was that I viewed Crestfall as a later orcish base that sort-of replaced Zul'Dare, your interpretation works too and I now prefer it; however I disagree concerning the orc viewpoint on the destruction of Zul'Dare. The orcs briefings state that your goal in act I is to test the human resistance, strike fear to the enemy, and pillage the southern shores of Lordaeron. At the end of Act I, in both campaigns these goals have been reached. Orcs don't mention the destruction of Zuldare, but they wouldn't care much - it had already fulfilled its purpose, and the orc commander and his forces are moving out to Khaz Modan. This was not the real invasion yet, it was more of a prelude. But I was wondering - currently you are going for a strict Horde/strict Alliance approach. Aren't you going to try and merge both versions? After Warcraft II is dissected, the later works are going to help in tying the pieces of the campaigns together. It'll all be merged, after that! Intriguing. See, when putting Cho'gall's inspection in the Alliance campaign, I usually assume it would've come first. A successful inspection, but then the place gets raided. But you make good points about the extra need to inspect the refineries after the damage from a raid, and about Cho'gall traveling to Grim Batol from the north. It's hard for me to imagine Stromgarde getting pillaged anywhere outside of a Strict Horde campaign, because I feel like it's the sort of thing that would be mentioned somewhere in the Human Briefings if it happened. Though nowadays it is really easy for me to imagine a failed attack on the city, giving Danath a moment to shine. I'd like to add that in effect at the end of Warcraft II, after the fall of Blackrock spire and the destruction of the Dark Portal, there is still an orc presence in Khaz Modan : the Bleeding Hollow clan is still there, and according to later lore the DragonMaw clan was as well, despite their participation in the last battle : they probably hadn't brought Alexstraza herself. Interestingly, we'll see that the lore of Warcraft II: Beyond the Dark Portal places the Bleeding Hollow Clan renegades in the Black Morass, until they pass through to Draenor. The renegade dragons who get convinced to join the Horde are hanging out at Blackrock Spire. And of course the Dragonmaw holdouts make sense, but don't be surprised when my Alliance map moves the Dragonmaw location to the Portal - at least for the covering of this current game! The lore of WCII:BtDP is going to say that clan got captured, after all. Which mean in all cases, Lothar was wrong in assuming the Horde would gently leave Khaz-Modan by themselves, following the raid on Grim Batol. That's part of the reason which makes me doubt that this part ever happen, even in a strict-Alliance scenario. It was just an assumption made by Lothar, and later proven wrong. So, a map of the situation at the end of Act III would be a replica of the what it was at the beginning of the Act, but with both Stromgarde and the Blacktooth grin clan weaken and their bases having suffered lots of destruction. As far as a complete Horde pullout from Khaz Modan after Grim Batol, I do agree that it seems a tad extreme. But, just for this moment, I wanted to take the Alliance campaign at face value and imagine what the war would look like from that perspective. I don't blame Blizzard for ignoring that in later sources; it seems such a waste to abandon so much territory and also purposely separate the Horde's armies from each other (one in continental Lordaeron and the other in continental Azeroth). We'll find that it's kind of hard to place the Grim Batol refineries with later lore, because the role of refineries and oil in general is going to virtually disappear in later sources. Before Warcraft III comes out, we're going to have a strong basis for doubting that the refinery centers at Grim Batol or Stratholme even existed in the first place! You could add a medium fire on the refineries of Grim Batol, and peons repairing it..
For this last one, I thought about adding a peon carrying away the Runestone as if it were an armful of lumber . . .
. . . but it takes me long enough to post these already. And now they're competing with my certification homework. Looking at those orc briefings, you do have a point that the main purpose seems to be sowing terror on Lordaeron's coast. The first level does mention the plan for "an assault on the mainland of Lordaeron", but future briefings do seem to indicate that the "assault" was probably just a set of raids. But man, I do like the idea of a blocked blitzkrieg. Last edited by BaronGrackle; 05-14-2013 at 01:40 PM..
Warcraft II is dissected, the later works are going to help in tying the pieces of the campaigns together. It'll all be merged, after that! Aha! This approach make sense, I'll be waiting for this! I don't know about Danath. I fear that even if he would have been present and helped repel an assault with his militia, someone else of higher rank would have taken credit for it. Assuming we are talking about Danath the mercenary captain, represented by the footmen sprite and most likely intended as a commoner, and not Danath Trollbane of later lore. I personally like the idea of Stromgarde being indeed pillaged; I don't think it would have changed much the course of the war thought, and certainly wouldn't have stop Stromgarde armies and militias to fight. It would have been mostly a severe blow for Stromgarde pride, and some fear for the Alliance. Actually, it could have even help militias and a simple mercenary captain to become the real heroes of a war in which the mighty Stromgarde Knights were not able to protect the main city. And it can help to explain the angry position of Stormgarde regarding how to treat orcs once the war is over. About Beyond the Dark Portal, and the Bleeding Hollow clan... I am certainly waiting to see how you will sew the different parts together; both campaigns clearly dismiss each other, and there are contradictions with the manual... the Bleeding Hollow clan is one of these highly confusing parts. "The Horde is preparing to launch an assault against the mainland of Lordaeron" : I had the feeling that they were referring to the future acts III & IV - the main invasion, not Act I. They are giving you the great goal of this war for us orcs : after the pristine, white towers of Stormwind, the alabaster parapets of Lordaeron capital. This is where we want the next big picnic to take place, with another renown human king to kill. The strongest human kingdom now that Azeroth is ours, this is what we are aiming at! Why bother with small Kul Tiras? Let's celebrate the might of our great Warchief, Orgrim Doomhammer once again, in the most beautiful city in the North! Last edited by Acanthostega; 05-16-2013 at 03:58 PM.. I don't think I'll spend as much time on BtDP as I am on ToD but definitely. As far as the RTS game itself goes, I think the Alliance campaign and Horde campaign can only co-exist until Human 2 and Orc 4 - the Battle for Nethergarde Keep. After this, it either turns into the Invasion of Draenor or the Second Invasion of Azeroth. and there are contradictions with the manual... the Bleeding Hollow clan is one of these highly confusing parts. Yeah. I kind of think it would've been better if Orc Act I had kept you from building Troll or Goblin units, and only introduced these when you came into Azeroth in Act II and reunited with the Bleeding Hollow. It would've worked, since you didn't have access to dragons yet. I've sort of reconciled them by saying that Kilrogg and part of the Bleeding Hollow crossed the Portal before the game began, but then another sizable section of the Bleeding Hollow stayed behind and met with Ner'zhul's Horde when they crossed back. Currently, where BTDP is considered, it is assumed that the Human campaign mostly happened after the orcish one. The only two missions that kinda ruin the narrative are the New Stormwind one (where the Horde razes the city once again to find the Book of Medivh) and the last one (where Ner'zhul opens the portal on Azeroth to conquer new worlds). The first one is kinda hard to tie in because of the novel (even though I'd really like it), and the second one was actually tied nicely by changing only one thing: Ner'zhul is trying to get the orcs back to Draenor, not to the new worlds yet. Well, and the fact that most of the Shattered Hand moved in through the portal too. But I'd still like the New Stormwind mission to stay in canon somehow. Maybe the dragons DID raid the city... which led to the kingdom's having to hire MORE stonemasons, then being unable to pay the debt. Interesting. The orc campaign makes much less sense without the razing of Stormwind, I don't know why they would remove that. If I am not mistaken, human2 (battle for Nethergarde) was also turned into a defeat, in order to delay the human campaign. That would make human3 different as well - it features the rescued Bleeding Hollow clan, who would have already returned to Draenor with the Scepter of Sargeras by then - but we also get Thunderlords in this level, so go figure. the last one (where Ner'zhul opens the portal on Azeroth to conquer new worlds). I am okay with orc12 following human3, but for the rest I don't really understand - in the original game, Ner'zhul never leaves Draenor at any point of the orc campaign; the ending take place on Draenor, this is where Ner'zhul opens his portals to new worlds. The orc player and everyone Ner'zhul cared off crossed the Dark Portal between the video and the ending text, leaving Grom Hellscream, Korgath Bladefist and their clans behind. After all, the goal was to conquer new worlds in addition to Draenor, not in replacement of it. Because Ner'zhul only opens his portals at the very end of human campaign, I can understand why that part was delayed in canon, for the rest of the human campaign to take place. I suppose the betrayal was removed in order to keep Grom Hellscream and Kargath in the story for a while longer, thought that was mostly unnecessary. I would have preferred the original betrayal to take place, I think it was important for the character development of both Ner'zhul and those he left to rot on Azeroth. As far as units and techtree goes, even if the game kept the old formula from Tides of Darkness, you get some hints that it is supposed to be a little different. Thunderlords are supposed to have Wolfriders, for example. The conflicting point is mostly the story of Kilrogg great escape as told in the manual, in regards with the campaigns briefings. In the manual he escapes after the Portal was destroyed, with the help of Ner'zhul (how? why?) and with Dragons; while in the briefings, orcs apparently escaped before the Portal was destroyed, without any dragons, and Kilrogg is never mentioned. To make things worst, later on Thrall and Kilrogg are supposed to met in the canceled game. Last edited by Acanthostega; 05-17-2013 at 03:51 AM..